What is Data profiling? Data profiling is the process of exploring data within a data set (file or database) and through statistical and other measures, determining the data quality and suitability for different uses. 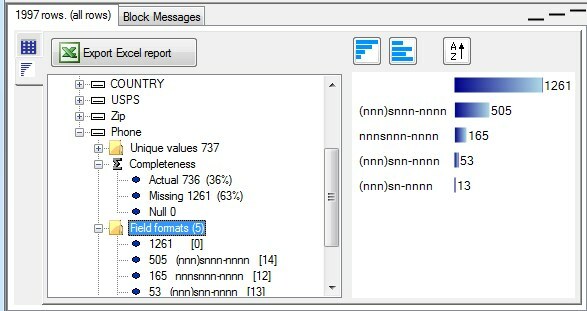 What if there was an affordable tool that took snapshots of your data, and gave you instant analysis, with point and click drill down into the problems? Datamartist is a visual, easy to use tool that installs in minutes on your desktop, costs less than a single day of a database consultants time, and yet gives you a powerful new way to look into your data. Without data profiling, you are flying blind. If you are specifying your ETL design without having reviewed the data quality of your source data, the ETL jobs are going to be broken from the start. Even though the data was SUPPOSED to follow the data dictionary, the reality is that in real systems data quality is nearly always an issue. By data profiling your source data sets ahead of time, you can ensure that you are aware of the issues. Monitoring data quality with ease. Because Datamartist gives you a both a data profiling tool and a data transformation tool, and can be run automatically, it is a simple, powerful platform to create a data quality monitoring program. Download the free Datamartist trial now. It's risk free, it installs in minutes, and you'll find how easy it is to get insight into your data quality issues. Or if you'd like us to do the work, we can provide affordable, fast data profiling services that let you understand your data quality quickly, and get immediate results.